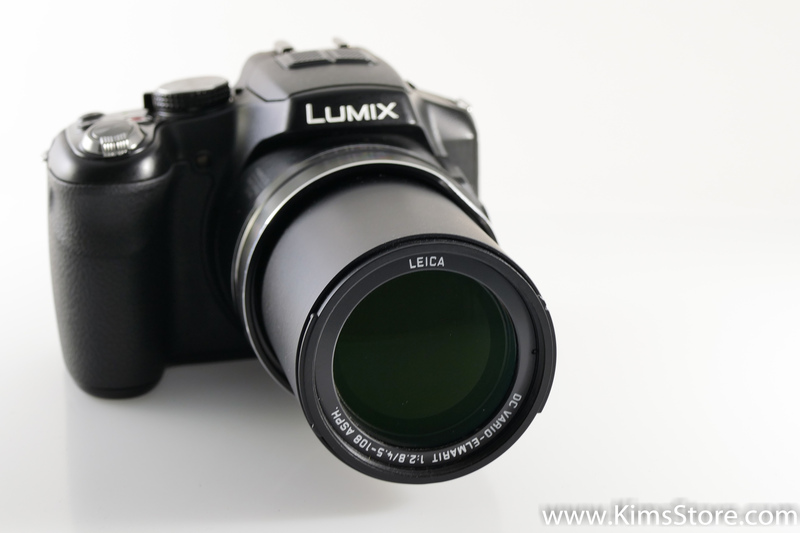 Reviews of Cameras I’ve owned- Mostly Pansaonic Lumix. I’ve always been the person with a camera at holidays but I didn’t get serious about it until about 2007 or so. I had a Canon Powershot A720is that I liked, and was upset when the battery door broke as we pulled into Grandfather Mountains parking lot. In hindsight, that jump-started my love of photography. I replaced my Canon with the Panasonic DMC-FZ100 After much reading and searching. I’m a spreadsheet nerd and do it with almost all my purchases. What I liked about my Fz100 was the ability to video (slow mo, high def and reg), screw on 52mm filters and macro lenses. I bought a remote trigger for the lack of timer options like my Canon had. I require a viewfinder, hot shoe and really like the fully articulated LCD. I limit the ISO to 400 and have been very pleased with the quality of photo and video. In fact, two of my photos won in two competitions. I wish it had a larger sensor. I think the weight and size is fine. This was my first longer zoom and I loved it. I was on the fence about if I wanted a camera with a dedicated ‘camera’ battery or just regular batteries but the dedicated rechargeable camera battery last longer. I just buy an extra one. I also bought an eye-fi wi-fi SD card so I could quit opening the battery door as often to get to the card. I wanted to avoid a door failure and that fit the bill. Documentation has started to only come on a DVD- so starting with this camera I pay to have a full spiral bound manual printed. I’ve tried Olympus, Canon, Kodak, Samsung and the Panasonic. 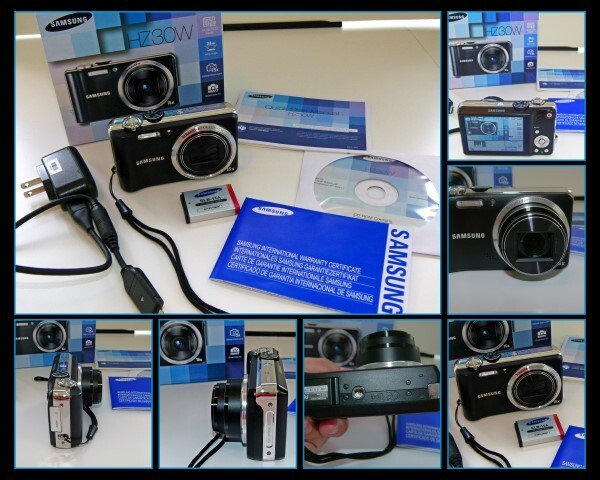 The Samsung HZ30w For Sale see Info@SellingVille.com is small, has a pretty good zoom, and has PASM. I hardly use and therefore I never know how to get to what I want quickly and often just put it on auto. It’s nice to have a small camera to put in your purse or hand to my hubby when he needs a camera and I don’t really want to hand over my favorite camera. It’s better than a phone and small. I’m sure I’d like it even better if I used it more. I did indeed replace my Pany FZ-100 with another Lumix, the FZ-200 and found a new favorite camera. This camera has so much I love. It seemed a little odd to me they dropped the MP in the fz200 from the fz100 but I had my 100 set to top out at 12MP anyway. I seldom use the flash but bought a diffuser and bounce that in the hot shoe for when I need the flash and don’t want to give my blue-eye’d cats red eye. I LOVE the fixed 2.8 on the fz200! Ya know how you have that favorite car… The FZ200 was my favorite camera. I have LOVED this camera! This is the camera I used for the winning first place animal shot for Our State Magazine of an elk and a few other contests and for the cover of WNC Magazine. I learned where all the buttons where. I had the full manual printed and read it like a book. It just outperformed the specs in my opinion. I liked that I could go from 1cm macro to mountains in the distance with the 25-600 mm Leica lens all with constant 2.8 aperture for those great bokeh backgrounds. I like I can use auto or manual with the PASM settings. The fz100 had a swivel LCD, and now after owning two, I never again want to own a camera without the fully articulated LCD. It makes it so much easier to go low or high handheld or on a tripod. I like and use the 12 fPS burst; the ability to screw on filters; the size and weight are good. I love that it has an LCD and a viewfinder that isn’t a snap on extra using the hot shoe. I like having video there when I want it. I like how long the battery last. If I had anything to change… and it’s not much I wish it was less noisy at high iso’s and that the timer had a few more options so I didn’t need to use a wireless remote to be in family pics but all in all this is a great camera to always have with you without the bulk of carrying around lots of weight or extra lenses. The detail in bird feathers even when I’m zoomed all the way out is incredible. The camera is a tad larger than my fz100 but still quite manageable. In August 2015 I received the Fz1000 as a gift, but for the first time I didn’t sell my previous camera, and for the first time I had things, I liked better about my last camera. On paper, the Fz1000 beats the Fz200 hands down. In the real world, my world, and for how I like to shoot and what I like to shoot there are several things I like better about my fz200. I REALLY miss that extra 200 mm in zoom- a LOT! This could be repeated over and over. Had to buy new filters and close-up lenses because the filter mm size was different. This was a gift and Panasonic was running a 3 yr extended warranty which they would not honor on my gifted camera even though I asked before sending in the bar code off the box. 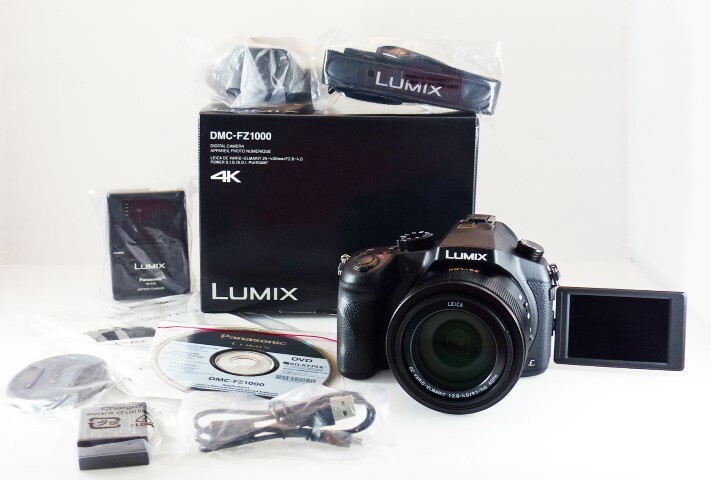 So, little bit of negativeness regarding their customer service on this 3rd Panasonic Lumix. I don’t think it’s fair you can’t get the offer if someone gifted you the new camera. Tripod plate covers the ability to open the battery / card door. Did they really think we wanted to remove the plate to get to the battery or change out an SD card? I like the ability to control timer shots with my phone so I don’t have to carry the remote release. I like some of the features like double exposure shots, time-lapse, and a few other things. Not that I use them all that often but still neat. The battery was the same as the 200 so I could still use the extras I bought. I loved the constant 2.8 on my Fz200 with a longer zoom than the FZ1000 but I really thought that 1″ sensor would be nice. I also thought hey “what’s 200mm” and thought with a larger sensor and more mp I could just crop and get the same or better quality photo… I was wrong. Since I don’t print my stuff I really see no advantage with the larger sensor other than noise reduction at high iso’s and the extra mp to me just means each shot is taking up more room on my hard drive. The fz1000 has 4k video but that really doesn’t matter to me. I mean I want video, but don’t need 4K – esp since I don’t have a TV to watch it on anyway. The fz1000 should be better in low light but I guess I shoot lots of other things like, subjects 600mm away or close-up macro and I didn’t notice. I am glad they kept the variable articulated screen, viewfinder and hot shoe. I wish it didn’t weigh so much more and that I didn’t need to get a new bag, all new filters, and macro lenses as the the Fz200 had a 55mm filter thread and the fz1000 is 62mm. Still, I like it- I just don’t love it and for that price tag I wish I loved everything about it. For what and how I like to shoot the fz200 may have been a better fit or possible the new fz300. Sounds like I’m stuck on Panasonic- I’m not but I do like their features in the superzoom cameras. I’m glad to see this breed of bridge superzoom and sensor size continue. I want more than a point and shoot but less than a heavy DSLR that I have to carry around multiple lenses for. I hope to see the in-betweens like this bridge camera, or micro 4/3 or SLT and mirrorless lines keep growing. For bird photography and zooming way in from a distance, my fz200 is a better fit for me. The fz1000 lends itself to its native settings and not going over 400mm. Which apparently I do that all the time! I just need to use it differently than my 600mm fz200. 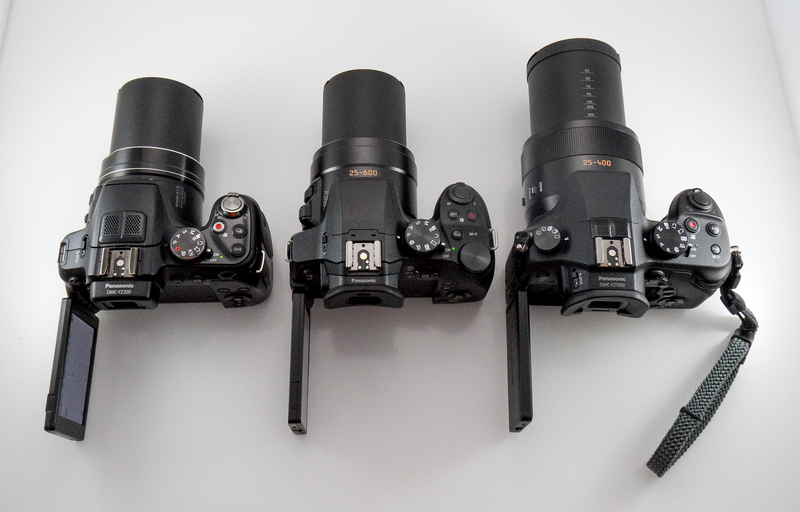 I’ve owned the FZ100, 200, 1000 and now the DMC-FZ300 (in middle). With the 11.25.15 firmware update, the post focus, or focus after the fact is simply awesome and I can’t wait to try it for focus stacking. It actually takes a video for this. Finally, unlike the fz1000, the battery door hinges so that I can leave my tripod plate on and still get to the battery and card. That’s a biggie. Metal tripod screw is nice and even nicer now that I can open the battery door with it still on the tripod!! Just like the fz1000 I like the focus peaking. It’s great when you don’t trust your eyes. The fz300 is weather sealed. Now I take very good care of my cameras and I never get to the beach so water and sand are not really an issue for me. I have rain covers and umbrellas with me when I’m out. Just like the fz1000- I just can’t get the wi-fi to work w. my PC. I get to where it sees my computer then it asks for a user name and password to who knows what. I’ve tried the computer user name, the modem, the workgroup all in combo with passwords and I’ve never gotten it right. Also, you do have to turn on file sharing and turn off password protection off your PC to even get that far. No internal memory on this one like the 200 had. I liked the buffer for a few shots if I forgot a card, or filled up a card AND I kept a stock photo of “If found please call” photo. In case a good Samaritan found my lost camera. They changed the lens hood some by making it shorter- not sure why. Flash/vignetting? I wasn’t sure how I’d feel about the touchscreen. I use it on my laptop and phone and found on this camera it is kind of necessary. On the older push and rotate control dial, you could push in and get to your setting then roll the dial to adjust. Now you have to know your Fn buttons or use the Q. Menu, then roll the dial. Being able to touch for focus here and pinch and pull is a nice touch (pun intended). Since I’m using two cameras at the same time I can ever remember how to adjust say, the shutter speed or aperture and I have to push the DISP to get the screen to show ALL the settings, click there for what I want, push the DISP to get back to the viewing screen and repeat if I want to adjust it again. Now, all that could be solved if I could remember what wheel, button, scroll etc that lets you just adjust those settings on the fly. The post focus is totally cool and I’m glad to have it but a few things I’ve noticed in playing with it. It’s not something to just leave on. It’s something to turn on when you’ll know you want it because there’s a delay as it processes the photo. Also, the LCD doesn’t show an in-focus shot at the time of capture. However, it will focus in camera on whatever you tell it to afterward. It doesn’t do as well on birds if they move and I think the 4K photo will be better for fast moving subjects. Still, it IS great for photo stacking and works best on a tripod. I wish the more expensive Fz1000 had this feature. I found it a little tough without going back to the full manual as to why a setting would be grayed out and had to search for what I was trying to set to on and couldn’t because I’d turned something else off or on that affected what I was trying to do. I’m used to the fz200 and fz1000 and keep trying to depress the top control button to make my selection before rolling it- that’s going to take some getting used to. Not sure I’ll notice it…. but there was a sensor change from CMOS to back-lit. Again a nice feature if you need it is that it’s weather sealed. Oh and I don’t think I mentioned it, but all the zooms go farther when set to jpg than in RAW. Nikon is coming out with a few bridge long zooms and Panasonic has come out with the fz1000 successor, the fz2500 but they left the 1″ sensor. I made spreadsheets galore when I was looking. Then I found dpreview.com and its side by side comparison. Now they almost have at least one thing incorrect on the list. I never wanted the weight of one with a mirror but I thought I wanted interchangeable lenses. I bought the Panasonic DMC-GH1 from B&H and within a week I was going for a walk and didn’t want to take my big bought-for-my-40th camera because it was so heavy. So I returned the GH1 and started my hunt again. These are likely all standard now but I’d still compare if I found myself between two cameras that I liked. They all seem to have plenty of resolution for me as I hardly ever print anything. Self-timer w. more than a 2 and 10 sec choice would be nice so I don’t have to carry a timer or mess with syncing my phone. NOT plastic parts holding the battery door or memory card door closed- well this was more important before I bought a wi-fi SD card but my wifi card doesn’t transfer RAW so I’ve started using the cable. This entry was posted in Catch ALL page (blog), Photography and tagged Lumix, Photo gear, Photography, Review on November 18, 2015 by KiM.